My name is Diane Cramer and I specialize in residential properties in the northern Denver Metro area including the communities of Westminster, Broomfield, Thornton, Northglenn, Arvada, Brighton and the surrounding areas. With a background in consumer education, I particularly enjoy working with first-time buyers and first-time sellers as well as senior sellers. My Realtor husband Steve Cramer and I have been working together since 1995. Our combined experience in the real estate industry totals over 50 years. I’ve earned the following professional designations by taking additional courses and garnering the required experience. They include Certified Residential Specialist (CRS), Accredited Buyer Representative (ABR), Seniors Real Estate Specialist (SRES) and Accredited Staging Professional (ASP). I really enjoy helping my clients prepare their homes for sale. As Broker/Owners of EXIT One Realty, our combined skill set insures that our clients receive the finest service available. Buying or selling a home can be stressful. 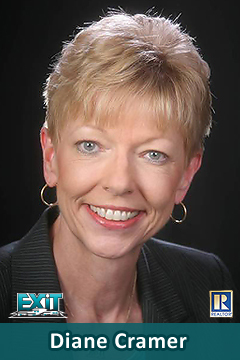 Our job at Exit One Realty is to make the process exciting and rewarding. Our goal is to consistently deliver extraordinary service with professionalism – all while having the most fun possible. When I entered the real estate business I combined the “loves” of my previous careers: housing, law, accounting and people. I’m a graduate of Colorado State University where I majored in consumer sciences and housing. For additional information see www.steveanddiane.com . I’m blessed to be a Colorado native and have been actively involved in the Denver Metro community for over 30 years. I’ve served as presidents of the North Metro Denver Realtor Assn., the Metro North Chamber of Commerce, the Westminster Rotary Club, Crime Stoppers, and the Community Artist Series, and served six years as Adams County’s representative on the Scientific & Cultural Facilities District. In our spare time, Steve and I love to entertain, cook, travel and play with our dogs. Not many dogs can say they’ve been to 44 states and 2 provinces, but Sammy, Lexi and Alpen can. I’m also an avid fan of HGTV and always have a re-decorating project on my to-do-list. Steve and I would love the opportunity to earn your business and add you to our list of satisfied clients.